Police Brutality Protest Begins March From Staten Island to Washington D.C.
CHARLESTON — Dozens of protesters started a march from Staten Island to Washington D.C. by walking across the Outerbridge Crossing on Monday in a rally against police brutality. 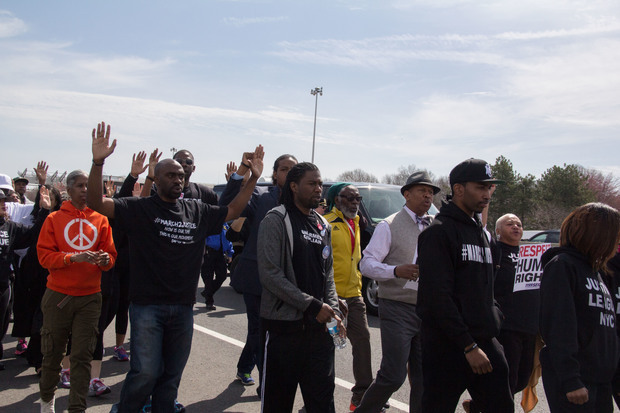 Justice League NYC kicked off its week-long march, called "March2Justice," with a rally at the foot of the Outerbridge Crossing. It included 150 protesters, union members and elected officials who gathered to protest recent police brutality cases — including the death of Eric Garner on Staten Island. Following the rally, the protesters began marching over the bridge at roughly 11 a.m. — shutting down New Jersey-bound traffic in the process. Only 50 people were allowed to walk across at one time so the rest of them had to take a bus to New Jersey, where they will reunite in Newark. "This is a historic moment," said 62-year-old Harlem resident Henry Singleton. The procession will cross over five states and organizers have stationed gathering points in each state. The march will culminate at the National Mall in Washington D.C. on April 21, according to the organizers. Councilwoman Debi Rose, who spoke at the initial rally, called the protest this generation's version of the Selma to Montgomery march, which took place during the voting rights movement in 1965. "This is our Edmund Pettus Bridge, this is our chance to take the message across to Washington," she said. Other elected officials, including Borough President James Oddo and State Senator Andrew Lanza, criticized the march for shutting down New Jersey-bound traffic on the bridge for nearly an hour on Monday morning. They called Port Authority's decision to close the bridge "appalling" and encouraged bystanders to ignore the protesters. "This would break a long-standing policy of not allowing marches or pedestrian traffic of any kind on our bridges," according to a joint statement released on Friday. "That policy has been in place because doing so would not just create a mere traffic inconvenience — it is unsafe....We all support peoples’ right to protest, but not at the expense of others who rely dearly on this bridge for transportation," the statement read. "Also like many of you, we fully support the work done by the NYPD and think it is wrong that some people are disparaging and generalizing so many of our best and brightest New Yorkers. "That said, if this march does proceed, we are asking our neighbors to join us in paying as little attention as possible to it. The intention of many of these marchers is, and has always been, to get arrested and make a scene in front of the news cameras. The less attention we give, the better; and the sooner the march will head on its way to D.C."
In response to the statement, Rose said the demonstration, which was about "bad acting" officers and not anti-police, was worth the detour. "There are alternate routes the travelers could take to get to Jersey, but there's no alternate route to justice," Rose said. "This is about incidents that we've seen repeatedly happened and that we want a change."